The abdominal aorta is the main blood vessel that carries blood from your heart to your legs and also supplies blood to the abdominal organs such as the liver, spleen, bowel, kidneys etc. An abdominal aortic aneurysm (AAA) is a dilatation or ballooning of part of the aorta due to thinning of its wall which makes it weaker. This is often silent and become symptomatic only when quite large or when it bursts. A ruptured aortic aneurysm is often fatal. 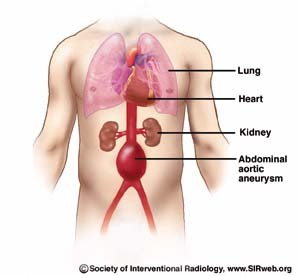 Aortic aneurysms are detected by an Ultrasound scan or by a CT scan. Depending on the size, you may be offered treatment. Aortic aneurysms are usually treated when they become 55mm or larger in diameter. Sometimes they are treated earlier if the growth is fast or if it becomes symptomatic. The treatment options are mainly open surgery or EVAR (Endo-Vascular Repair of Aortic aneurysm). The EVAR is done via small groin incisions and only involves a short stay in hospital. EVAR is now approved by NICE in the UK. There are pros and cons to both methods and some aneurysms are not suitable for an EVAR. Your vascular surgeon should be able to advise as appropriate. We offer Ultrasound scanning for suspected or known aortic aneurysms and can arrange for CT scans as appropriate. Feel free to contact us as appropriate.